Stackpole Nature Reserve at Stackpole Nature ReserveStackpole is both a listed designed landscape and an internationally important National Nature Reserve. Footpaths radiate from the site of Stackpole Court, a grand mansion demolished before the National Trust owned this area. Binoculars at the ready, Stackpole's teeming with wildlife all year round. Spot the infamous otters at the lakes, bats roosting in the woodland and butterflies on the wing. The spring-fed Boshertston Lakes support rare freshwater plants, and there’s a healthy population of otters here. They feed on the eels, pike, perch, roach and tench that live in the lake. The otters really are the stars of Stackpole and occupy a special place in staff, volunteers and visitors’ hearts alike. Stackpole's home to the largest colony of greater horseshoe bats in Wales, one of the largest concentrations in Britain. The greater horseshoes are one of 12 species of bat that live here; sleeping, breeding and hibernating in many of the old buildings and trees across the estate. The estate's varied landscape makes it a great spot for our feathered friends. In the woodland, you'll find wrens, chiffchaffs and goldcrests right through to buzzards, tawny owls and sparrowhawks. Bosherston Lakes welcome wildfowl during the winter - with the likes of goosander and gadwall making an apperance. You'll also spot breeding birds too including the heron, kingfisher, little grebe and moorhen. Head closer to the coast and you may come across chough - two or three pairs breed here in caves and crevices in the cliffs. Of course, you're likely to hear them before you see them, with their "kee-aow" cry unmistakable. In summer, they're often seen in pairs or family groups. In winter, you may be lucky enough to see a small flock. They feed largely on insects and grubs for which they probe in the short coastal turf or in the dung of grazing cattle. Butterflies - At least 30 species are commonly found here. Many of them depend on short grazed grassland rich in coastal flowers. One is the silver-studded blue. The common blue butterfly can also be found fluttering around the estate. Once the vegetation gets too tall or scrub starts to move in, we start to lose some of our butterfly species, so it’s important that we keep it open with the help of grazing animals. We enlist the help of sheep (in winter only, as they eat flowers), cattle and Welsh mountain ponies. 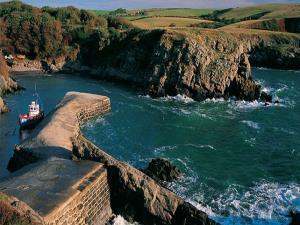 Stackpole is both a listed designed landscape and an internationally important National Nature Reserve. Footpaths radiate from the site of Stackpole Court, a grand mansion demolished before the National Trust owned this area. Open every day from dawn to dusk. Bosherston Lily ponds OS: SR 967948, manned/pay & display. Stackpole Quay OS: SR 992958, manned. Broadhaven South OS: SR 976937, manned. Lodge Park OS: SR 977962, manned. All car parks free to NT members.